A massive new online business is scheduled to launch on July 11: Apple’s App Store – an online hub for third party iPhone and iPod Touch applications. Beginning later this month, developers will begin to upload apps to the store accessible by iPhone users or to a new section of the iTunes Store, sharing revenue from app sales with Apple in a 70/30 split. 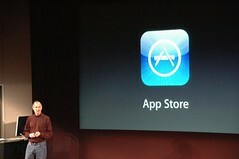 These apps will be in addition to the 1,700-odd apps already developed for the iPhone’s Safari web browser. One of the games people are looking forward to playing is Super Monkey Ball. 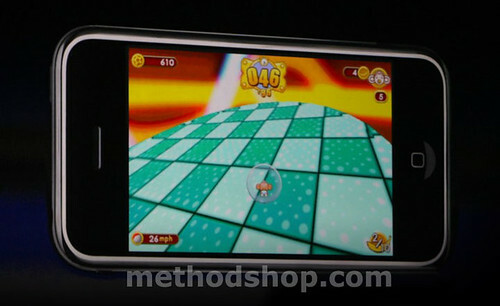 Sega’s Ethan Einhorn showed off Super Monkey Ball on stage at the WWDC. According to Einhorn, after 8 weeks of development, the developers have created 110 stages. The new 3G, GPS-enabled iPhone should open up a world of possibilities for clever developers in the realms of gaming, entertainment and enterprise applications. In related news, the AOL Radio app for the iPhone won for Best Entertainment Application at the 2008 Apple Worldwide Developers Conference (WWDC), providing users free access to over 350 online radio stations (including 150 local CBS radio stations) and more than 200 AOL Radio channels.